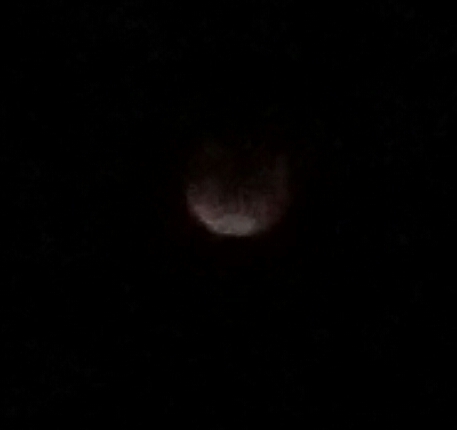 Also called a Blood Moon this eclipse lasted for about 1 hour and 12 minutes. 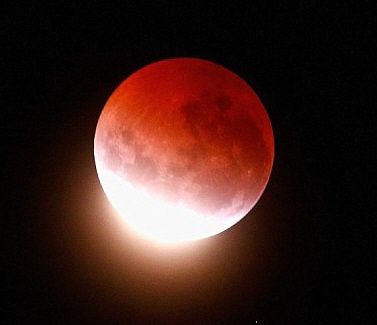 September’s full moon is also called a Blood Moon, because it presents the fourth and final eclipse of a lunar tetrad: four straight total eclipses of the moon, spaced at six lunar months (full moons) apart. Phew! 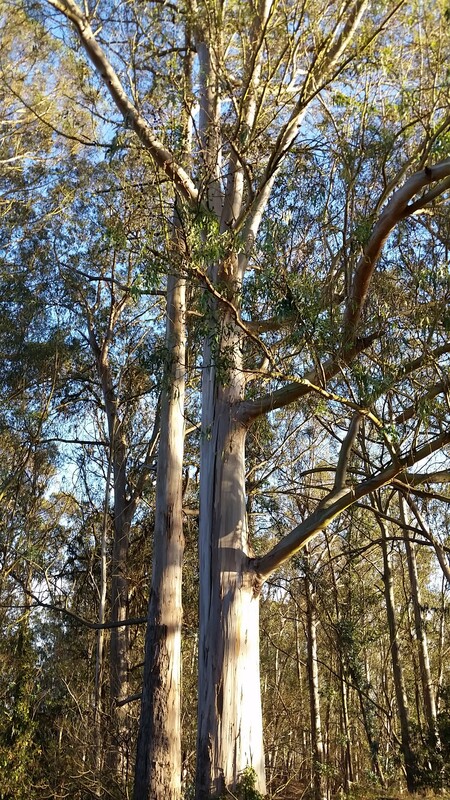 These Blue Gum eucalyptus in the El Cerrito Hillside Natural Area are not included in the $5.5 million FEMA funded fire mitigation plan approved for Oakland, UC Berkeley and the East Bay Regional Parks. 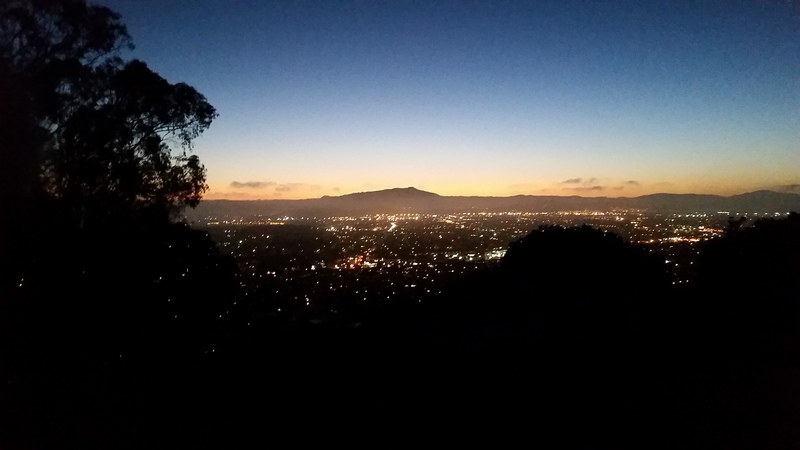 Oakland and UC Berkeley came up with similar proposals, both of which called for the wholesale removal of eucalyptus trees, a highly combustible nonnative species that was widely blamed for fanning the 1991 firestorm. 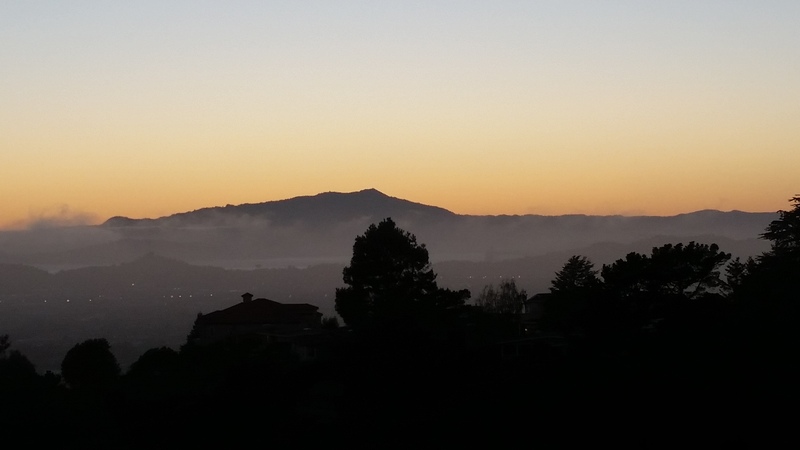 Environmental groups, including the Sierra Club, strongly backed these plans, while some neighborhood groups staunchly opposed them on the grounds that they amounted to clear-cutting. 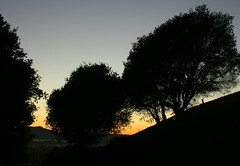 The East Bay Regional Park District, by contrast, settled on a plan to gradually thin the eucalyptus and other vegetation over time. 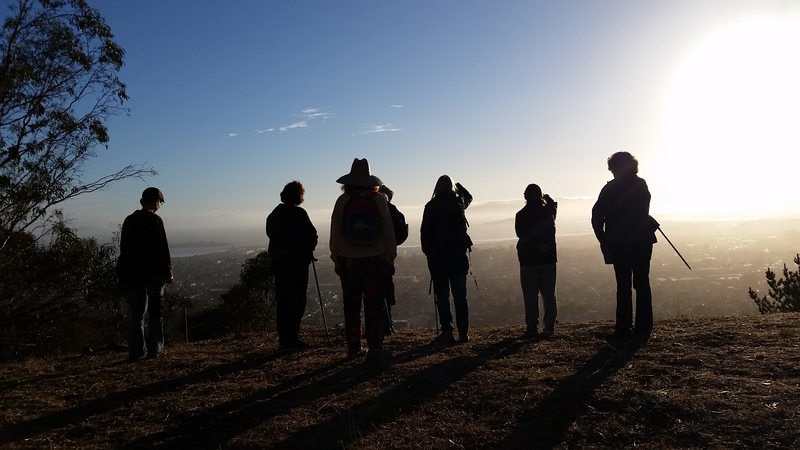 In March, FEMA announced the approval of $5.6 million in grants to UC Berkeley, the City of Oakland, and the East Bay Regional Park District. 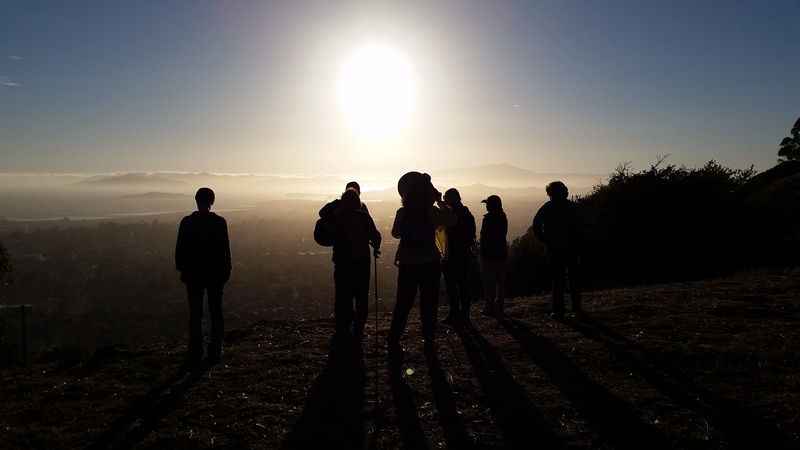 But in its approval of the funds, FEMA advised UC Berkeley and Oakland to adhere to the “thinning” method similar to the one proposed by the park district — rather than their clear-cutting plans. 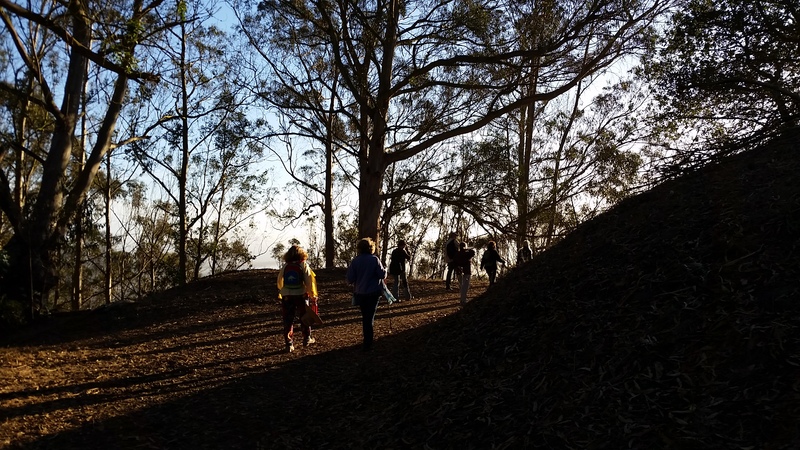 The eucalyptus trees pose a larger risk in the hills than in other locations, because there are so many of them and they’re clustered together. It’s not just that the trees are “quite flammable,” but that the eucalyptus groves in the hills are so dense. In dense forests with closed canopies, flames can jump through the treetops, propagating what’s known as a crown fire. Thinning the trees and therefore reducing the canopy, he said, would help reduce the risk of a crown fire in the hills. 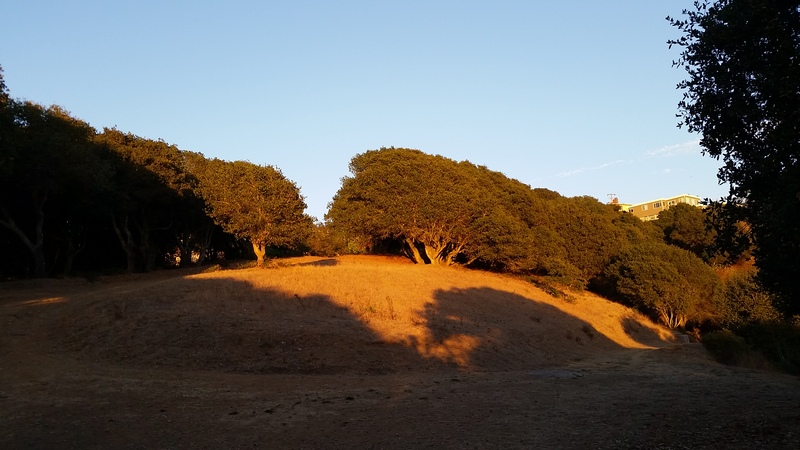 The Sierra Club and the group Claremont Canyon Conservancy contend that the thinning plan won’t be nearly as effective as permanently removing and replacing the eucalyptus trees with native vegetation. Norman La Force of the Sierra Club’s San Francisco Bay Chapter, calls the thinning plan a “complete 180” from the earlier proposals. He noted the danger that eucalyptus trees pose in propagating fire, and questions why FEMA would not endorse removing more of the nonnative trees. Although the Hills Conservation Network and the Sierra Club have opposite views about eucalyptus and the FEMA plan, both have filed lawsuits against the federal agency, raising issues of public transparency and alleging that FEMA didn’t fully consider other alternatives to the plan it put forth. Both groups said they’re concerned that the “unified methodology” is ambiguous and needs to be compared to more alternative proposals. 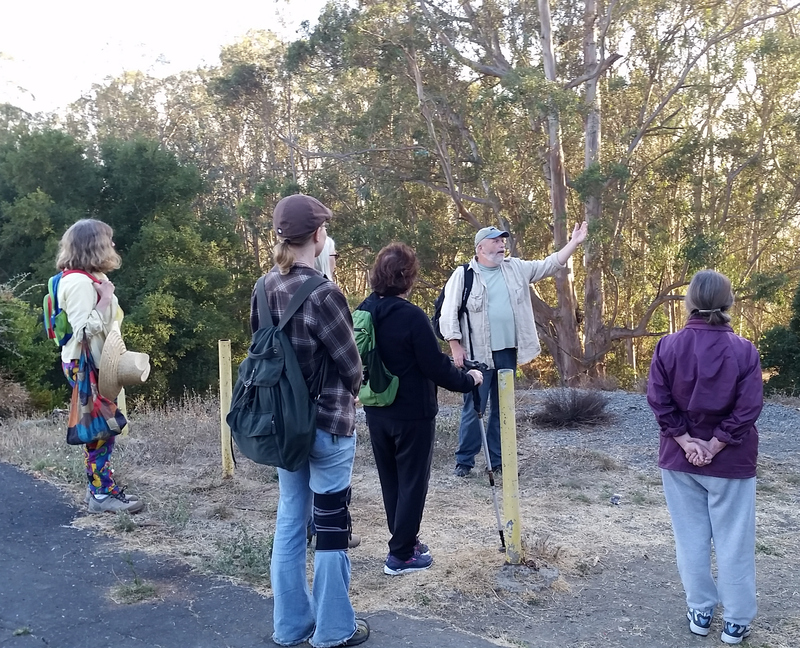 From El Cerrito Trail Trekker’s Description of the Ridge Trail: One of the most popular entrances to the Hillside Natural Area is at the end of King Court, at the meeting of King Drive. and Shevlin, just north of Moeser Ln. There begins the highest of the north-south trails, the Ridge Trail, #30 on our newTrail list. With its higher elevation and more open vegetation, the Ridge Trail offers some of the most spectacular vistas available in the park. From King Ct, the trail follows the upper rim of the old quarry before turning north towards its finish at the end of Regency Ct. Before that it crosses the Navellier trail (#29), which has entrances at both its top and bottom. 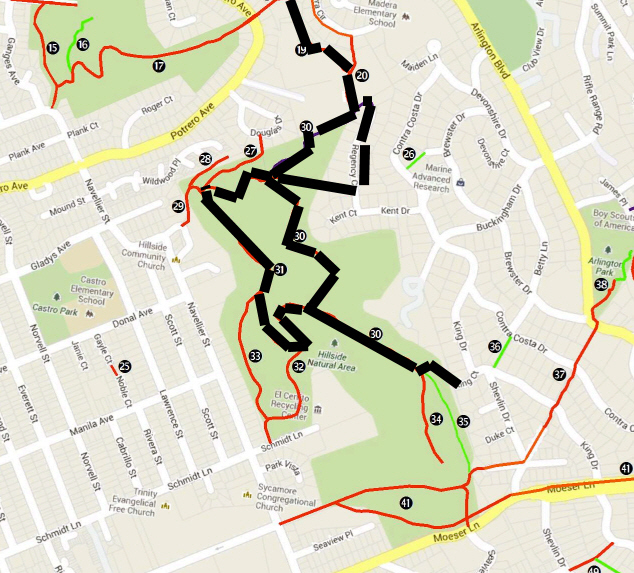 Because of this connectivity, the Ridge Trail is an important thoroughfare for people who live in the surrounding area. 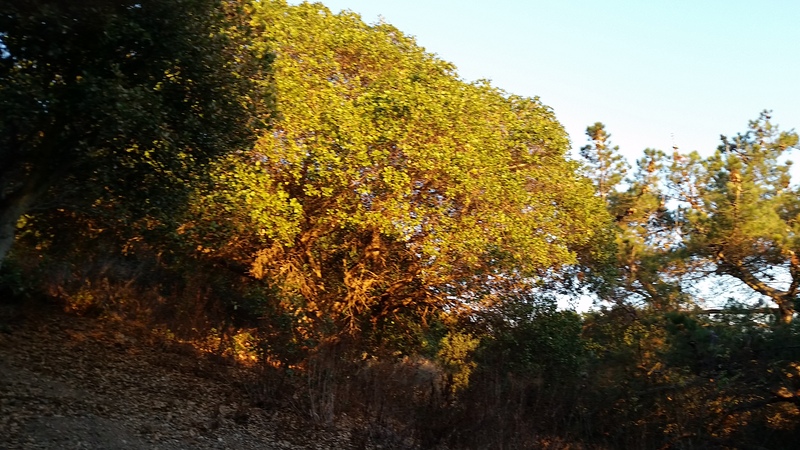 Now that the Madera Property has become part of the Hillside Natural Area, it is even more important. Because just below the end of Regency Ct. is one of the main entrances to the Madera Open Space. The acquisition of this plot of land connects the northern and southern sections of the Hillside Natural Area. 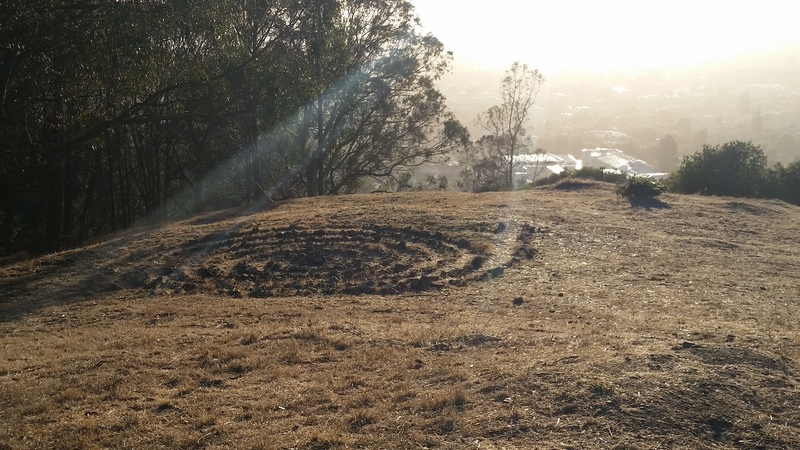 The labyrinth is an archetype, a divine imprint, found in all religious traditions in various forms around the world. The path winds throughout and becomes a mirror for where we are in our lives. It touches our sorrows and releases our joys. Walk it with an open mind and an open heart. From El Cerrito Trail Trekkers description of the Live Oak Trail The second of the two major north-south trails is the Live Oak Trail. 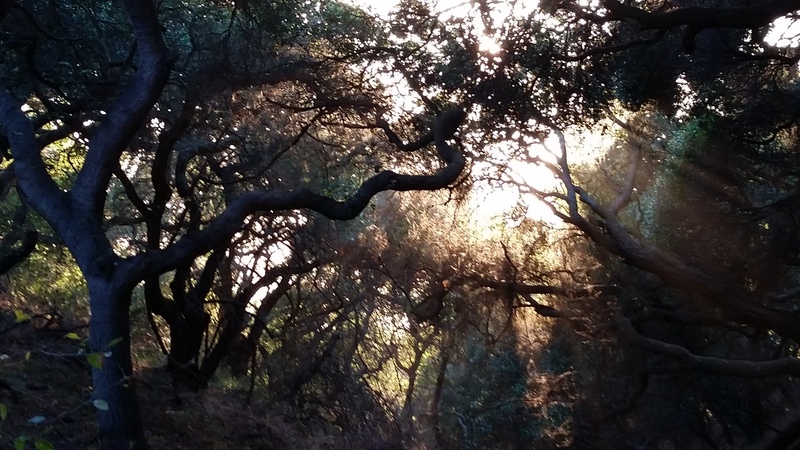 The Hillside Natural Area is a popular dog-walking spot and the Live Oak trail is probably one of the best used routes. 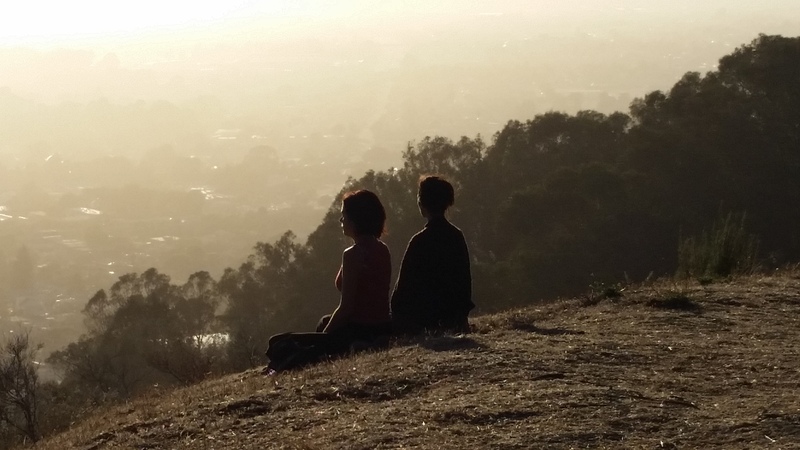 From its start in a stand of eucalyptus trees, the trail then moves on to an open hillside, with two benches suitable for views, rest or just silent contemplation. Moving on, we pass under the eponymous oaks and into the first of two small canyons that contain branches of Wildwood Creek (or would, if we ever got any rain). The main channel of Wildwood Creek forms part of the boundary of the southern section of Hillside Natural Area, and higher up the creek can be seen in the Madera Open Space. Eventually these branches meet the main branch somewhere underground in the flats, and Wildwood is itself eventually joins Baxter Creek, which finds the bay in Richmond northwest of Point Isabel. Between the two creek beds is another open hillside, and still another bench, and the trail reaches its end after the second creek, where it meets the steep Navellier trail (#29). Across Navellier trail the path continues, but now called the Douglas Trail (#27). 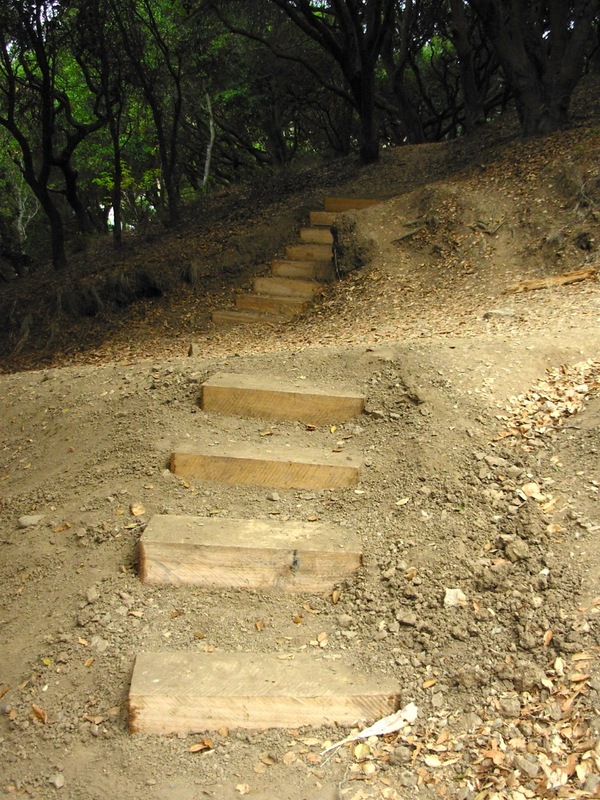 Douglas trail exits the park at Douglas Dr., a circle off Potrero Ave.
On either side of the Navellier trail, new steps were installed in 2013 as part of an Eagle Scout project by Johnny Wu of Albany. This is fitting, since Live Oak and Douglas used to be referred to as the “Nature Trail.” Why? Because many years ago another Eagle Scout project laid out an interpretive trail along the route. Numbered posts can still be seen along the trails, and although the hillside has changed over time, you can still download the guide from the Trail Trekker website. The guide exists in two forms, a pamphlet that you and print out and take with you, and a longer 15 page report on the nature of the Hillside Natural Area, or at least as it was then. Maybe a future scout will produce a new one. Until then, Friends of Five Creeks have natural history links for the park on this page, and also have this page at inaturalist.org.